Shop for all your pizza equipment and make sure you have everything to help you serve and cook pizzas to perfection! From pizza cutters and pizza cutter wheels to ensure the perfect slice, to pizza peels to help you take your delicious pizzas out of the oven or pizza oven, or even scrappers to help you keep your oven clear of melted cheese on the bottom of the oven. No matter what pizza tools or gadgets you are after to serve the perfect thin based or deep crust pizza you'll find them here online! Our pizza equipment is part of a large range of kitchen equipment ready to order today. Whether you’re a pizza restaurant specialising in pizzas or a pub serving pizzas on your lunchtime specials menu, you’ll need all the correct pizza equipment to ensure you serve the perfect pizza. If you would like to know more information about the pizza tools sold by Pattersons Catering Supplies, please contact our team of catering product experts on 0117 934 1270. Bulk buy your catering supplies and save £££s! FREE UK delivery is also available on qualifying wholesale orders of professional kitchen utensils and equipment. 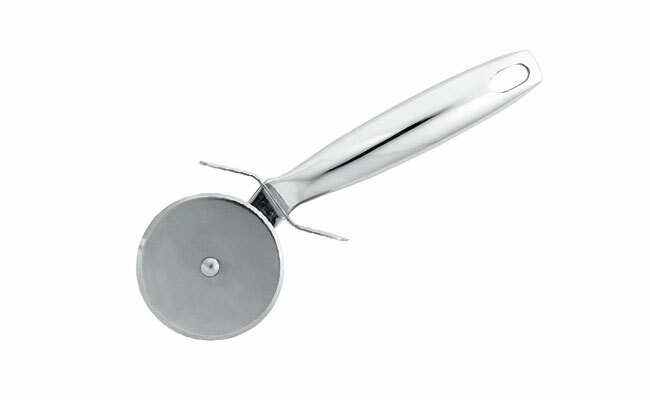 ABS Large Pizza Cutter Wheel 4"
Large Pizza Wheel Cutter 4"
Stainless Steel Balloon Whisk 40"